King's is much more than a weekly gathering of people - we're a family whose members are committed to each other and God's mission. 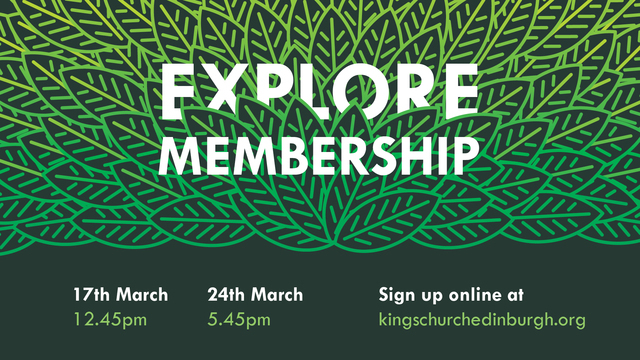 Explore Membership is your chance to find out what this means and how to play your part. Sun 24th March, 5.45pm, starting with tea, coffee and cake in The Hub. This will take place during the evening church meeting. Sun 17th March, 12.45pm, with lunch served at Luke & Deb Davydaitis' home just along the road from the church building. Book your place now for the 24th March OR 17th March so we can send you important information before the day itself, and make sure there's enough food for everyone. Remember to indicate any special dietary requirements in the notes section of the sign-up form!